Yesterday we visited Abydos, a drive of about 2 hours north from Luxor along the desert road that connects Cairo with Aswan. Abydos is one of the oldest sites in Egypt and contains archaeological remains from every period of ancient Egypt. A cult grew up in ancient times that it was the burial place of the god Osiris; and for a thousand years or more ancient Egyptians made pilgrimages to the site to make offerings. Today, it’s most famous for the temple of Seti I (father to the prodigious builder Ramses II) who ruled at the start of the 19th Dynasty, a little over three thousand years ago. The quality of the carving, many in raised relief, is outstanding. The detail on Seti’s crown in this photograph, for example, is exquisite. The temple is contemporary with the great Hypostyle Hall of pillars at Karnak. But unlike at Karnak, here at Abydos the original colours of the wall reliefs are beautifully preserved. Perhaps because of this, the content of the scenes is easy to make out, even for the untrained eye. 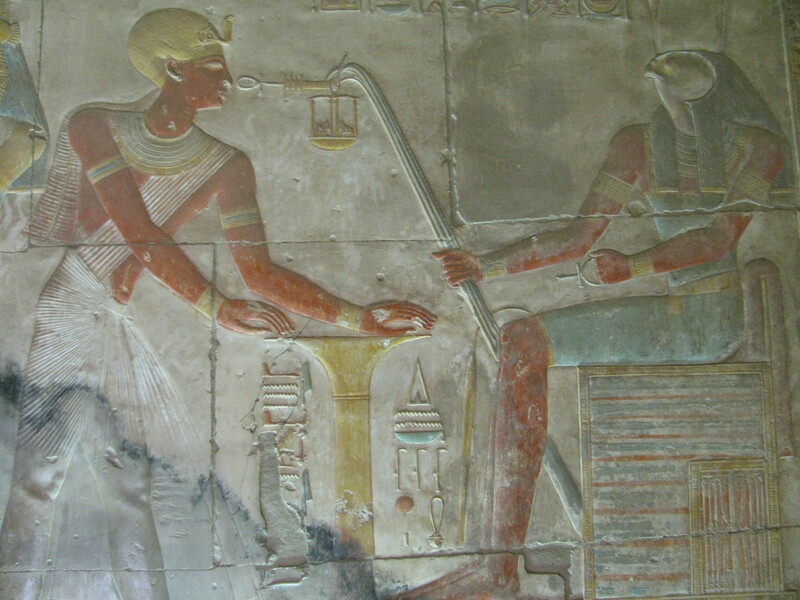 Here we have Seti I making offerings before all the major gods of the ancient Egyptian pantheon. We see him before falcon-headed Horus, ram-headed Knum, ibis-headed Thoth, lion-headed Sekhmet, jackel-headed Anubis and crocodile-headed Sobek. We see scene after scene of him before Osiris (god of the afterlife) and his wife Isis, with their son Horus. Of course, these scenes are replicated on temple walls the length and breadth of Egypt. But what really struck me at Abydos – where they hit you square between the eyes – is how little Pharaoh was prepared to leave to chance. Literally every square inch of his temple is decorated with scenes of him worshipping the gods. I’m very sure he was well looked after in the afterlife! 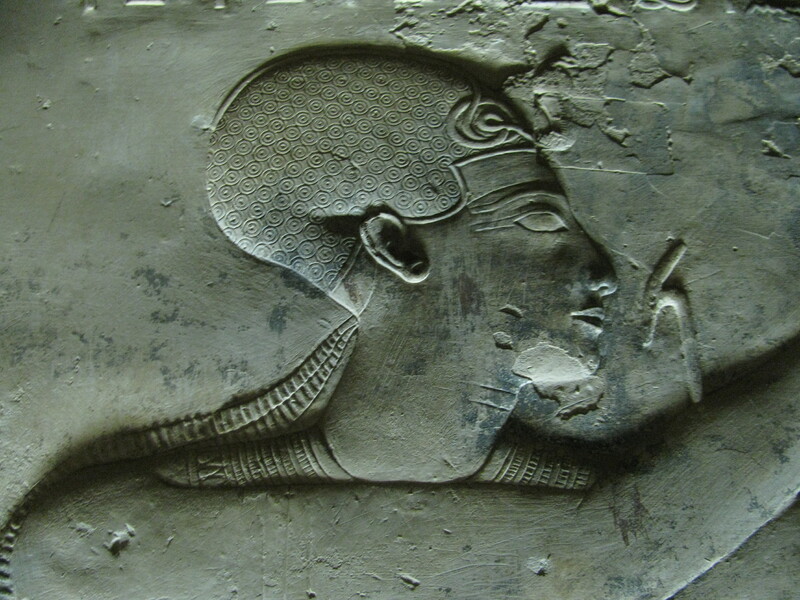 Abydos is also famous for its ‘king-list’. This is a wall carved from one end to the other with the cartouches of the kings of Egypt who preceded Seti I – from Narmer who unified upper and lower Egypt in the Old Kingdom through the Seti’s father Ramses I. Notably, there are a few key individuals missing. 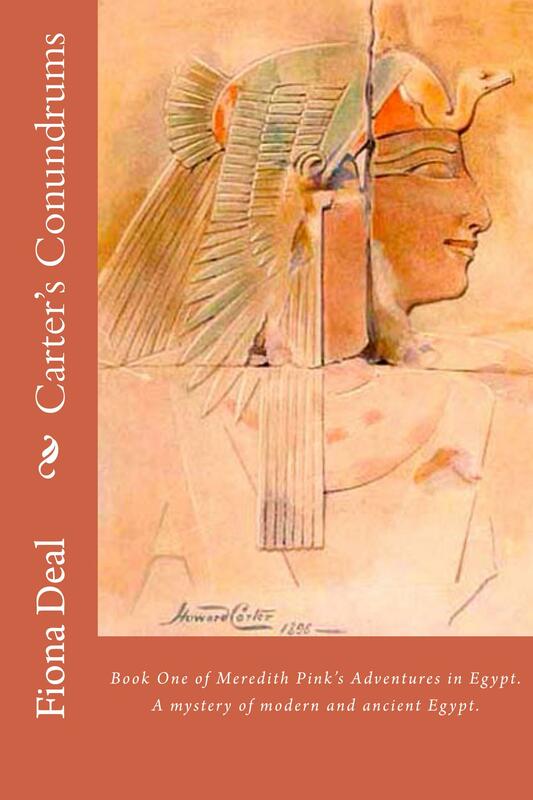 Hatshepsut has been left out – possibly because she was a woman. And the controversial kings of the Amarna period (Akhenaten, Tutankhamun and Ay) also fail to get a mention. The Amarna period was within the living memory of the older folk among the population – a time of social upheaval and religious oppression. Abydos is a wonderful temple – well worth the drive from Luxor. And I think my visit may have given me another idea for a book! Posted on April 9, 2013 by Fiona Deal. This entry was posted in ancient Egypt, Egypt, History and tagged Abydos, Abydos Egypt, AncientEgypt, egypt, Luxor, Osiri, Pharaoh, Seti I, Tutankhamun. Bookmark the permalink. Reblogged this on Egypt Tourism Board.